The mystery of the third wheel: Who takes all these 'private' celebrity photos? Does celeb-hood come at a constant cost which sounds like, 'Aap CCTV ke nigrani mein hain'? I have always wondered who takes such breathtaking photos of solo trips. In some close gatherings, I might have shared this strange curiosity. “If you ask people politely, they will take a photo,” is the answer I got. By ‘people’, they actually mean strangers or fellow tourists. And by photos, I mean those Instagram poses where you are looking away somewhere, pretending to have ‘lost and found’ yourself. So, solo travellers can pose like that in front of a stranger and then excuse themselves, saying, ‘Thank you’? But that I am not alone in my weird curiosity was proved when social media raised the question over a photo Priyanka Chopra recently posted. 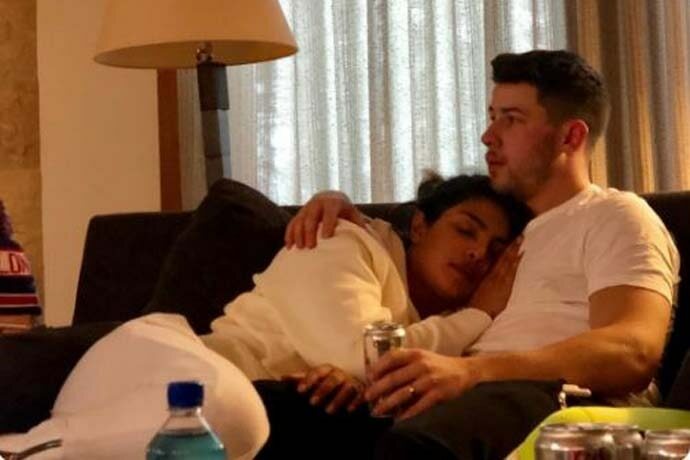 Captioned ‘home’, the photo features a relaxed Priyanka — her head resting on Nick Jonas’ shoulder, her eyes blissfully closed. Nick, on the other hand, is in a mix of a relaxed and a pensive mood, holding a can and, of course, looking away. A sense of comfort permeates the photo — a type of comfort which you won’t probably have if there’s a third person around. But, is there always a third person — or a team of third persons — in our favourite celebrities’ lives? That makes everything we admire about celeb lives so difficult. Wonder who takes the vacation photos that Virat Kohli keeps on posting from time to time? We are not contesting the mindblowing advancements of technology. We are not even saying that taking such photographs is not possible by Nick, Priyanka or Virat, Anushka. They are way smarter than we think they are. But then, they are also way too rich to do these things themselves. Aren’t they? Each of them individually has a group of assistants, PR managers or social media handlers. Priyanka’s team even has to manage the Instagram account of Priyanka’s pet dog, Diana. Indeed, if you have to embrace this omnipresence of a ‘third wheel’ in your life. Or, is this ‘third wheel’ a comfortably fitted part of their lives now? This Priyanka-Nick photo we are talking about has over five thousand retweets and 97,000 likes only on Twitter. I didn’t even dare check the numbers on other social media platforms. The amount of ‘love’ Virat Kohli gets on social media (when he is not playing) for his photos with Anushka is equally mind-numbing. But is that worth making a little room for this third wheel we are assuming all celebrities have in their lives? Some mysteries are better not solved.